The European Union maintains a network of over 130 Delegations worldwide. The EU Delegation to Egypt was officially opened in 1978. The European Union maintains a network of over 130 Delegations worldwide. The Delegations are normal diplomatic missions complementary to EU Member States’ Embassies and reflect the distribution of competences and functions between the EU Member States and the European Commission. The European Union Delegations are essential to the promotion of EU interests and values around the world, and are in the front line in delivering EU external relations policy and action, from the common foreign and security policy through trade and development co-operation to scientific and technical relations. 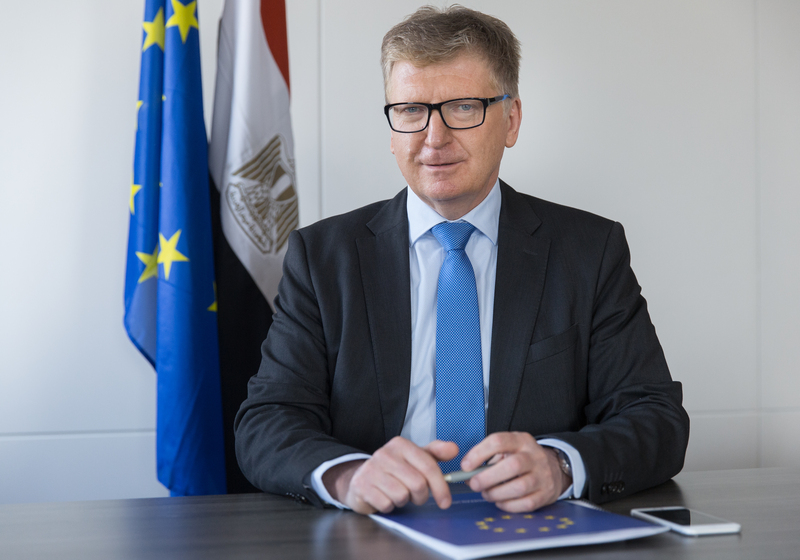 The European Union Delegation to Egypt, officially opened in 1978, deals with the broad political and economic agenda between the EU and Egypt, and in the context of the European Neighbourhood Policy plays a role in the implementation and monitoring of the EU-Egypt partnership priorities. The Delegation interacts with the government ministries but also with civil society and non-governmental organisations and reports to Brussels on developments in Egypt. An important focus is the management of the projects under the different development co-operation programmes concerning Egypt. The Delegation manages a development co-operation portfolio of over €1.3 billion in Egypt. The Delegation provides information about the EU, its policies and positions to interested parties through various means, including its website and social media platforms. The Delegation Press and Information Officer is in constant contact with the local and foreign media. Ahlan wa sahlan! Welcome to the official website of the European Union Delegation to the Arab Republic of Egypt. Today, we witness Egypt's energized pursuit to its efforts for further political and economic development and modernization as well as dynamic foreign policy. Egypt is aiming to strengthen its relations with its international partners and the EU has been a natural key partner of Egypt over the years. Egypt's efforts to achieve stability, prosperity and sustainable social and economic growth are in a centre of the EU engagement with our important neighbour on the other side of Mediterranean. The EU consistently supports the legitimate calls of the Egyptian people to attain stability, prosperity, their civil, political and socio-economic rights. The EU is not only Egypt's largest trading partner and the number one foreign direct investor but the EU and Egypt are strategic partners on international arena. We share strong relations bound by the Association Agreement. With the jointly agreed Partnership Priorities, the EU and Egypt have set clear objectives based on joint ownership, common interests, reciprocal commitments, differentiation, shared values and implementation of national plans and reform programmes, politically, economically, socially and institutionally. Egypt’s historical strategic relations with the Arab and African countries allow the country to play a key role for peace and stability in the region. The EU’s progressive role on the global arena and its enhanced contribution to peace, security and economic development in the Mediterranean and the Middle East will ensure Egypt and EU further develop their cooperation on regional and international issues. These include, among other issues, the Middle East Peace Process, fight against terrorism, migration, climate action and cultural dialogue. As Head of the European Union Delegation to 'um al dunia' Egypt, I look forward to working closely with the Egyptian government and civil society to further develop our bilateral relations and to enhance the understanding between our people. We have common interest in building prosperous, inclusive and informed societies that are based on the rule of law. I also seek to keep cooperating closely with the League of Arab States, providing common responses to our strategic challenges. I hope this website is a useful entry point to the EU-Egypt relations and to the EU in general. Please do not hesitate to contact our Delegation. We will be happy to provide information and response to your inquiries. Ivan Surkoš joined the European External Action Service and assumed his post as Ambassador, Head of the European Union Delegation to the Arab Republic of Egypt in February 2017. His career has had a strong emphasis on the Middle East, as he occupied key roles in the region such as the Ambassador of Slovakia to Syria, Lebanon, and Jordan from 2011 till 2015. He also served in Tunisia, Iraq, Yemen, and Egypt in the earlier stages of his diplomatic career. During his previous spell in Egypt he was the Deputy Head of Mission of the Embassy of Czecho-Slovakia to Egypt. Outside of the Middle East, he has also held notable assignments such as the Consul General of Slovakia in New York, and the Deputy Head of the Mission at the Embassy of Slovakia to Denmark. He further worked as the Director of Slovak Agency for International Development Cooperation. Within the Foreign Ministry of Slovakia, he served as Chief of Minister Cabinet and the Director of key departments, namely the Departments of Diplomatic Protocol, Middle East, Consular Affairs, and United Nations. Ambassador Surkoš graduated from Moscow State Institute of International Relations (MGIMO). He studied Arabic language, political history and international relations in the Middle East region. He obtained a degree in International Relations as well as in law at the Comenius University in Bratislava. He has also attended the prestigious École Nationale d´Administration in Paris. Ambassador Surkoš speaks Arabic, English, Russian, French and his native Slovak. He is married and with his spouse Lubica they have one son.